Anyone who's ever attended a NCAA regional final or Final Four inside a football stadium knows it's one of the most overrated experiences in sports. Unless you're a well-heeled booster in the good seats or a team mascot sitting on the baseline, your view is likely to be terrible and any semblance of atmosphere is devoured by the fact you're watching a basketball game inside a football stadium. After attending the Wisconsin-Davidson Sweet 16 matchup at Detroit's Ford Field in 2008, all I can say is give me a couch and my hi-def television any day. 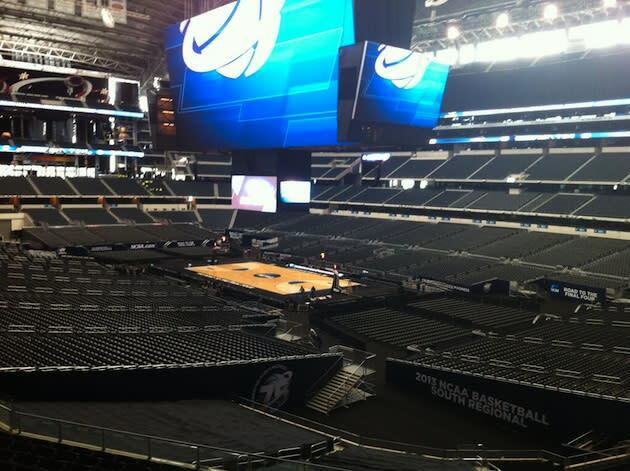 Fans attending the South Regional this Friday and Sunday at Cowboys Stadium, however, will be getting the best of both worlds at Jerry World. The stadium's giant HD scoreboard will give them a good view of the Kansas-Michigan and Florida-FGCU games and they'll also be able to occasionally glance down to see the action actually unfolding on the court. It doesn't sound like tickets are going to be an issue, either. While a record 108, 713 fans packed the place for the 2010 NBA All-Star Game, this weekend's crowds are expected to be between 30,000 and 40,000. That's "closer to a concert or bull riding event than an NFL game" or even a high school playoff game, the Dallas Morning News reports. Cowboys Stadium will be the host of next year's Final Four, but one official tells the paper that this weekend isn't a dress rehearsal and that all the big issues have been ironed out during the All-Star Game and the Super Bowl in 2011. Hopefully that means no big ticket issues for college hoops fans in 2014. Ready for the Sweet 16 and beyond? • Watch: Who could crash the Final Four?